You are browsing the archive for freedom of speech. In his home country of the United States, the first amendment to the national constitution famously guarantees this right. It also does in India, one of the world’s other great democracies. Of course, national jurisdictions vary in how they apply their laws, but Marlette’s assertion notes a role that editorial cartoonists tend to fulfil wherever and however they deliver their work. This is why the news from India about the arrest for sedition of the Indian cartoonist Aseem Trivedi is worrying. Trivedi is a campaigner against corruption who works digitally and deploys social-media distribution tools that are principally made by US corporations. We include the specific cartoon that brought his arrest below (the translation on the plinth is “Corruption alone triumphs”, a parody of the original text.) 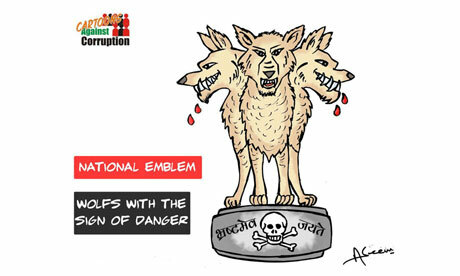 Trivedi’s drawings also frequently visually reference national Indian symbols and it seems that it is the offence derived from this that triggered his original arrest. It appears this morning that Trivedi is now to be released on bail, but as the conflict between national jurisdictions and pervasive digital distribution of words and pictures continues we can expect to see more of this sort of event even inside what is sometimes described as the “largest democracy in the world”. We’d like to encourage all friends of cartoonists to note the petition organised here on behalf of Trivedi. Many of our members have already signed it. If you have anything to add to our knowledge of this please do use the comments facility below. We expect to be returning to this subject. Update: 14th September 2012. The Indian High Court has according to this report in The Hindu newspaper rebuked the police for the arrest of Trivedi. Our friends at English Pen have different information and a drawing about the issue. Updated: 14th October 2012. The BBC reports charges against Aseem Trivedi have been dropped.